Here’s a short look at each election — and why it matters to global policy. Voters in 28 countries will elect all 751 members of the European parliament. 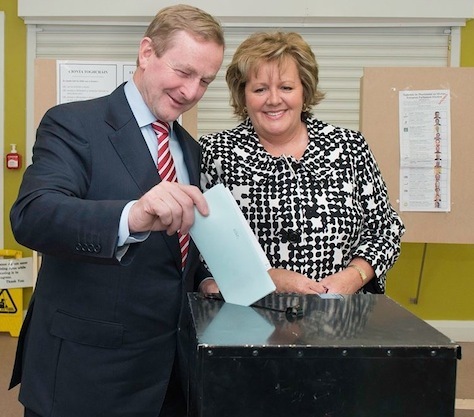 Elections were held in the United Kingdom and The Netherlands on Thursday, in Ireland (its taoiseach, Enda Kenny, pictured above) and the Czech Republic on Friday, in Slovakia, Latvia, Cyprus and Malta on Saturday. Remaining member-states in the European Union will vote on Sunday. Read Suffragio‘s comprehensive background explainer here. Read about why the European elections are actually four separate political contests here. Read about the race to become the next president of the European Commission here. Read Suffragio‘s list of 13 top eurosceptic parties here. Why it’s important: The European Union is larger than the United States. With the European Parliament gaining even more powers under the Treaty of Lisbon, which came into effect in 2009, it will play a correspondingly more important role in setting EU policy over the next five years. US policymakers and businesses will be particularly interested in the EP efforts to enact a tougher data privacy directive and shepherd the negotiations to enact the Transatlantic Trade and Investment Partnership, a potentially landmark free-trade agreement between the United States and the European Union. It’s been a tumultuous three months (and beyond) for Ukraine – it has seen an elected president, Viktor Yanukovych, flee from power after opening government troops to fire on protesters in downtown Kiev; it has seen the promulgation of a not-quite legal interim government backed by the United States and the European Union; it has suffered the annexation of Crimea by a newly aggressive Russia; and it now faces, potentially, a long-term separatist movement in eastern Ukraine, with pro-Russia separatists occupying key government offices in Donetsk and Luhansk oblasts. In today’s election, Petro Poroshenko, a businessman who briefly served as minister of foreign affairs for pro-Western president Viktor Yushchenko and as minister of international trade and development for Yanukovych in 2012, has emerged as the wide frontrunner to become president. His closest competition seems to be Yulia Tymoshenko, the former pro-Western prime minister and 2010 presidential candidate who was imprisoned after her 2010 loss to Yanukovych. If Poroshenko can’t win 50% of the vote, he’ll face a runoff on June 15. Read Suffragio‘s comprehensive background explainer (and all of its coverage) here. Why it’s important: The elections could mark the denouement of a Cold War-style international crisis between Russia and the West. If Russia and eastern Ukrainians accept the election’s results, the new Ukrainian president will be able to mend the Ukrainian-Russian relationship, forestall further Russian annexation of Ukraine, minimize the disruption of eastern separatists and fix Ukraine’s economy firmly within the European Union’s orbit through an IMF-led bailout and an EU association agreement, both of which could liberalize Ukraine’s underperforming economy. Juan Manuel Santos, who was elected in 2010 largely on his record as the defense minister of the conservative former president Álvaro Uribe, is struggling to win a second term, despite his efforts to broker a lasting truce with Fuerzas Armadas Revolucionarias de Colombia (FARC, the Revolutionary Armed Forces of Colombia). Uribe, who recently won a seat in the Colombian Senate, is backing his former finance minister, Óscar Iván Zuluaga, who has shot to the top of the polls in a dirty, scandal-heavy election. Zuluaga, who was originally seen as a stand-in for Uribe, who is no longer eligible to run for president, has made gains on the basis of a populist economic platform and his opposition to the peace negotiations with FARC. Santos and Zuluaga are expected to advance to a June 15 runoff. Read more of Suffragio‘s coverage of the Colombian election here. Why it’s important: Colombia has the third-largest economy in Latin America after Brazil and México. The country has made huge gains over the past 20 years, and the days of cartel-driven violence and anarchy are long gone. Santos’s efforts to negotiate a permanent peace truce with the FARC would eliminate the last violent political challenge for a country that’s spent much of its post-colonial history engaged in domestic conflict. In addition to electing all 21 of its representatives to the European Parliament, Belgians will vote for both its national government and the regional governments in Dutch-speaking Flanders, French-speaking Wallonia and the Brussels capital region. Walloon socialist prime minister Elio Di Rupo is hoping to win a second term after seeing Belgium through the worst of the eurozone’s financial crisis. After the last elections in 2010, however, it took Belgium 541 days to form a government. This time around, it’s expected that Flemish Christian Democrats will ultimately determine where the cross-ideological coalition that Di Rupo now leads will form the next government or a ‘Flemish front’ will come to power. The most powerful force in Flanders, which has eclipsed Wallonia in population, economic strength and political power, is expected to be Antwerp mayor Bart de Wever’s Nieuw-Vlaamse Alliantie (N-VA, New Flemish Alliance), a regional conservative party that supports greater autonomy for the Flemish regional government and, ultimately, Flemish independence. Read Suffragio‘s background explainer here. Why it’s important: Belgian politics remains incredibly fractured — not only does the country feature the full ideological spectrum of political actors from far right to liberal to centrist to green to socialist left, it features a full spectrum of both Flemish and Walloon parties. Dalia Grybauskaitė, the incumbent since 2009 and a former European Commissioner, easily led the first round of voting in Lithuania’s presidential election on May 11 with 46.61% of the vote, just shy of an outright victory, and she is almost certain to win reelection in the today’s runoff against center-left Zigmantas Balčytis, a member of the European Parliament, a former finance minister and briefly in 2006, acting prime minister. Aside from foreign policy, the Lithuanian presidency is an essentially symbolic office, but Grybauskaitė has been an outspoken figure in Lithuanian politics. Read more of Suffragio‘s coverage here. Why it’s important: Grybauskaitė, a strong NATO ally, is known as the ‘Iron Lady’ of Lithuania, in favorable comparison to the late British prime minister Margaret Thatcher. Though the Lithuanian presidency isn’t incredibly powerful in day-to-day politics, her expected reelection will return to office a powerful voice for Baltic autonomy at a time when Russia is trying to reassert itself within its ‘near-abroad.’ Lithuania, with 2.99 million people, is the most populous of the three Baltic states. In the early days of July 2013, Egypt’s defense minister and army chief Abdel-Fattah el-Sisi ousted the country’s elected president Mohammed Morsi amend wide scale protests of Morsi’s performance in office. Eleven months and a new constitution later, el-Sisi has now resigned from the military to lead a ‘civilian’ presidential campaign. He’s widely tipped to win after months of brutal military rule that suppressed Morsi’s Muslim Brotherhood, the largest Islamist group in Egypt, and that otherwise created a personality cult around el-Sisi, who has indicated he will introduce economic reforms designed to liberalize Egypt’s economy, reduce fuel subsidies and cut excessive public-sector spending. His sole opponent is the secular leftist political leave Hamdeen Sabahi, who finished only narrowly in third place in the freewheeling May 2012 Egyptian presidential election. Why it’s important: All signs point to the nearly complete reversion of Egypt from its post-Mubarak, revolutionary democracy back to a state controlled by the military. Though it’s not entirely sure how el-Sisi will govern Egypt, the world’s largest Arab country, with 80.7 million people, his likely election as president could concentrate more power within a military-backed regime than in the Mubarak era.